Michael Scott is an officer with the Foundation’s Environment Program, which makes grants to conserve the North American West and to tackle the problems of energy and climate change. Scott leads the Foundation’s grantmaking in the western United States and Canada, focusing on land and water conservation issues. Before joining the Foundation, he was executive director of the Greater Yellowstone Coalition in Bozeman, Montana, a nonprofit organization that works to preserve the ecosystem of the Greater Yellowstone region. Earlier in his career, Scott worked at the Wilderness Society, the League of California Cities, and in Congress for former representative Jerry M. Patterson of Southern California. 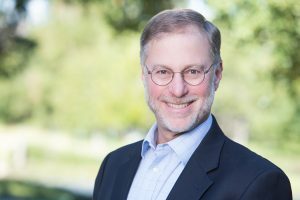 Scott has a bachelor’s degree in political science from the University of California, Santa Barbara, and a master’s degree in public policy from Claremont Graduate School. Here he discusses the Foundation’s grantmaking to preserve open lands in the West and the importance of this work. With all the environmental issues the Foundation might tackle, why make grants to protect open lands in the West? If you look at nineteenth-century settlement patterns in the West, the lands homesteaded and made private were, by and large, the big river valleys—where the water and arable land is. The mountains and deserts remained in public hands. But if you look at wildlife distribution, more than 80 percent of the region’s biodiversity is along those major river corridors. For example, a lot of the elk, deer, and other great animals can’t survive winter in the high mountains of the West. They need to leave for the lower elevations, a lot of which is private land. So if you stop looking at the legal boundaries of the land and consider whole ecosystems, you have to make a conservation plan that coordinates public and private land. What are some of the fundamental approaches to grantmaking the Environment Program takes in this work? We’re trying a tiered strategy. We make grants to organizations like The Nature Conservancy and The Trust for Public Land in their work to secure important ranchland in the West from development. This can happen in two ways. First, grantees can buy land outright and resell it to public authorities. That makes good sense when tracts are so sensitive and important for a particular species—whether for elk or grizzlies or whatever—that they really should be in public hands to ensure protection. But that’s a minority of the cases. More often, grantees buy what are called conservation easements—development rights—from a private landowner. The owner retains the right to use the land for ranching purposes, but can never drill, subdivide, or otherwise develop it. Although this approach leaves 10,000-, 20,000-, or 100,000-acre ranches in private hands, it’s less expensive and keeps intact local economies that have supported small communities throughout the West for the past 150 years. Easement agreements can be written many ways, but generally speaking, grantees buy development rights, oil and gas rights, and subdivision rights. Typically, a rancher will reserve some space for the next generation or two to build on the ranch. An appraiser determines how much economic value the rancher has given up by selling those rights, and that’s the amount paid. Sometimes the rancher will donate half this amount for a tax write-off and get cash for the other half. Owners who are land rich and cash poor might need the money and create a trust fund to ensure that the land stays a ranch in perpetuity. How does the Foundation use its grant money to have an impact? The Foundation’s grantmaking goes a long way. We support efforts by The Nature Conservancy and The Trust for Public Land to secure additional funds for land conservation. They have four ways of doing this. First, they can ask a rancher to consider donating a conservation easement. This involves no money—only the good will of the rancher, who can take advantage of a tax deduction if in an economic position to do so. Third, The Nature Conservancy or The Trust for Public Land can raise the private money it needs to purchase a million-dollar easement. Finally, these two grantees can work with state and local governments interested in securing important lands in their jurisdictions. (The Hewlett Foundation is prohibited from making grants for lobbying and does not fund the ballot and legislative work.) The grantees work with the government entity or other private individuals to fund the purchase by getting a bond issue on the ballot or by passing legislation that creates funding mechanisms for it. The state of Oregon recently passed a proposition put on the ballot by citizens that allocates 15 percent of the state’s lottery money for land conservation. That’s nearly $100 million annually to secure future conservation efforts in the state. Colorado does the same thing, as do a number of local governments throughout the West. What part of the western conservation problem is actually being resolved by this work? What percentage of land that should be protected is being protected? I haven’t seen estimates of the total amount of sensitive open land in need of protection, but I can tell you that we’re supporting just a small fraction of what’s needed. I suspect most people think that the federal government has the most money to help on land conservation. But in fact, the federal contribution is a drop in the bucket compared with what state and local governments spend on this issue. And they’re doing this by will of the people. And while the Hewlett Foundation, like all foundations, can’t make grants that entail government lobbying, we can support grantees’ research and other work to generate enthusiasm for conservation. How has this work changed in recent years? Certainly the economic downturn affected the amount of money available for this work. The years 2007, 2008, and 2009 were not great for land conservation, but in 2010 and 2011, people have seemed willing to look at this issue more closely. This is true even though states are experiencing some of their worst budget problems in decades? Yes, people are still casting votes that show they’re willing to pay for conservation and wildlife protection. Yet in these difficult economic times, states that have the option are admittedly looking to limit what goes toward land conservation. So, if that money is coming from lottery proceeds, state officials might be tempted to return it to their general funds. Regardless of the size of a land conservation fund or its fluctuation from year to year, what’s most important is a sustained commitment on all sides to continue to do the work. Is the work changing in any other ways? I’ve seen a growing awareness, which I described at the outset: state and local officials working on these issues have begun to take a big step back and see conservation in terms of complete ecosystems, asking how a particular tract fits into animal migration or considering how a river section is important to, say, the wild trout population. What would success look like for this work? It would be when all the important western habitat and parks are protected. That’s the long-term goal. The good news is that our grantees are making progress toward it.